We strive to deliver the best quality re-sole possible and are committed to getting you back on the rock in the shortest possible time. 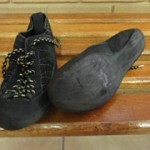 We only resole climbing shoes. Our resole business is situated in Johannesburg – we bought the business in October 2010 from the previous owners of Rockfrog Resoles. Our dedicated and experienced resoling technician, OJ, is in charge of our resoling workshop. Prices are kept to an absolute minimum and there is no need for deposits. In fact, in the interest of customer satisfaction and quality of service, we prefer our customers to pay only once they have seen the results. After all, the only way to ensure that a sustainable business grow, is to make certain that every climber who sends shoes our way is happy with the outcome. 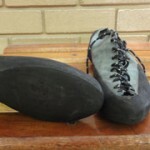 Our workshop is equipped to replace worn rands and/or worn soles on climbing shoes. We are able to discount our prices significantly if you provide us with 10 pairs of shoes or more at a time. Please contact us directly at info@verticalworld.co.za for special prices. 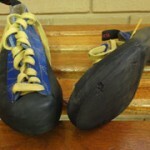 To replace soles, we use the latest and greatest XS Grip® rubber from Vibram or Grippin E® rubber from Ocun. Some of the best climbing shoes in the world are made using this rubber. To replace the rand (i.e. 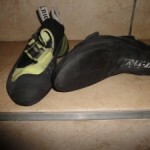 upper rubber parts) around a climbing shoe, we use extremely durable Grippin D® randing rubber from Ocun. Because we are climbers ourselves, we understand that the shape of your favourite climbing shoes is extremely important to you. Using specialised equipment and the correct thickness of rubber, we spare no effort to maintain the shape and curvature of the shoes during the resoling process. Some of the best climbers in SA send their high‐end shoes to us for resoling for exactly this reason. Not all shoes are made to the same standards or are in the same condition when it is sent to us ‐ we therefore cannot guarantee that we will always be able to maintain/restore the exact shape and curvature of all shoes sent to us for resoling. We typically provide a turnaround time of about 4 weeks, but in exceptional cases we can fast track a pair of shoes through the process. 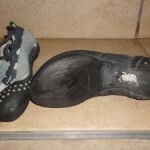 When Should I Resole my Climbing Shoes? Have the edges eroded into smooth, rounded tips? Are you climbing on your rand rubber (toe caps or thin rubber sides of the shoes) as opposed to the edges of your soles? Is the fabric under your rubber starting to show through? Are the rands peeling off in many places? Climbing shoes are not made to last forever. If you climb regularly, you will probably go through at least 2 pairs of shoes a year; more if you climb indoors. Resoling offers you a much cheaper alternative to buying new shoes every time you wear the original rubber out, and it allows you to keep your favourite pair of shoes for another season. Take a look at your shoes. By taking action sooner, rather than later, you can prolong the life span of your shoes, as there is virtually no limit to the amount of resoles that a well looked after pair can withstand. What can I do to Maximise the Life of my Climbing Shoes? remove grit and other corrosive particles that literally grind the rubber when you climb. shoes is likely to do more damage than climbing in them. Avoid exposing your shoes to direct sunlight and avoid climbing on very hot rock surfaces. Heat weakens the glue which bonds the rubber to the shoes, and will eventually cause your soles to peel away from your shoes.